I tend to be rather fond of jerky. You know, dried salted delicious dead animal hide. There's beef jerky, turkey jerky, chicken jerky, even buffalo jerky. I used to particularly enjoy my ex-wife's homemade spicy beef jerky. Once in a while, especially when I'm out on a long trail hike, I'll pick up a bag of the Jack Links ("Messin' With Bigfoot") peppered beef jerky, which isn't exactly the world's finest fare, but I have to tell you, it'll do in a pinch. Better back up. Early this afternoon, while gathered with some friends, a spontaneous and mutual decision to vacate Greensboro took us to Chapel Hill, where in years long past I hung out with some sort of frequency, and where friend Jenny spent a significant if rather hazy portion of her life. We ended up at this blasted place called A Southern Season, where you can find everything from Klingon cookware to Evil-brand wine to insane-looking ceramic frogs to massive, erupting mountains of dark chocolate truffles. It was here that I found a bag of elk jerky ("Made from Natural Elk"), and since it was on sale, I did what I had to do and bought some. 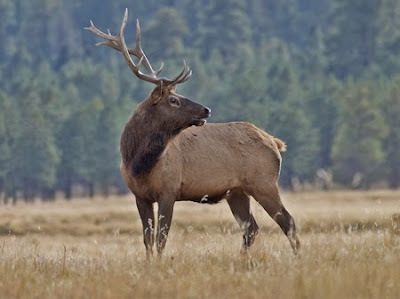 Pretty good, that elk. Not as good as Mrs Death's spicy beef stuff, but definitely okay as a novelty. We tooled around Chapel Hill for a while, stopped at a handful of bars, and had dinner at the Spotted Dog, where all the items on the menu give you the impression that you might be better off if you're a canine; however, the human fare is actually quite decent and very reasonably priced. I enjoyed a bloody mary and a turkey burger that made me almost as happy as an unsalted elk. Interestingly, nearby is an establishment called The Southern Rail, which is built around a couple of old train cars. Back before the turn of the century, those particular cars were home to Green Monk Studios, the film company that belonged to my friend Storm Williams...and that served as the setting for my story, "Eye of the Devil," the sequel to my perhaps more well-known novelette, "Fugue Devil." Of course, there were some caches in the bargain. Of course there were. Probably the most fun I've had doing an interview. Nicely conducted by Mr. Eric Mays. A bit of blathering about everything from Dark Shadows to Deathrealm, from Godzilla to the publishing business, from Cthulhu to modern education. 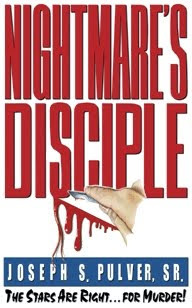 Check it out at www.theauthorsspeak.com. Also...writer Gail Martin made a neat little video of the guests, including ye old Rodan, at ConCarolinas a couple of weeks back. It's on YouTube, here: Gail Martin's Visions of ConCarolinas. No caches today. Just martini. Martini good. Spent the better part of the day yesterday in Selma, NC, at the home of multi-tentacled Bob "Crypt of Cthulhu" Price, who has been hosting Joe "The Pulverizer" Pulver (author of Nightmare's Disciple) for several days. Joe is soon to be leaving these shores for the alien spawning grounds of Berlin, Germany, where he will be residing in an abandoned shopping mall, penning new nightmares and chowing down on the local populace. Always a treat to see Joe — a rare one, alas, and soon to become rarer. Here's to many new, foreign horrors for the Pulverizer. Naturally, I occupied myself on the trips coming and going by snagging bunches of geocaches — about thirty, give or take a handful. Would have bagged more, but the heat was so oppressive, if I didn't find it in about a minute or so, I didn't bother hunting further. Did quite a bit of caching both Friday and Saturday as well, including a big old nighttime hike with a couple of fellow cachers on the Owl's Roost Trail in NW Greensboro, and a slightly challenging tree-climb on Saturday. By the time I hit the hay last night, I was feeling danged near exhausted...so tonight, I'm taking care of the indoor chores, of which there are many. Unfortunately, the lawnmower and I have a date looming on the near horizon, and aren't I just thrilled? Mercy; today would have been my dad's 80th birthday. He passed away in 2001, which sometimes seems ages and ages ago...and other times so recent that I can recall every detail of that very difficult time. 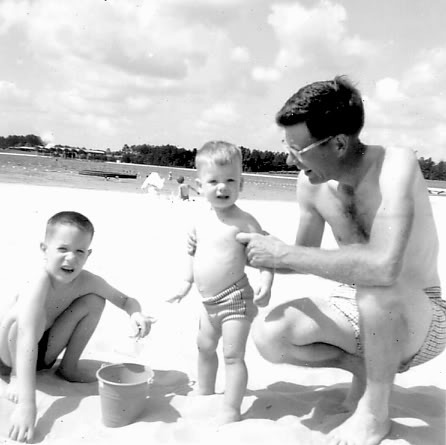 For many years, our family would go to the beach around the time of Dad's birthday, so most of my memories for this week in June are of sun and sand. Good times indeed. And suddenly, I have a hankering to go to the beach. Today is also my great-uncle's 94th birthday. He's still getting along; hope I do so well if I ever manage to make it to some ripe old age. Of course, I was never sure I'd make it to 50, and now I'm past that, the future seems closer but less predictable than it used to. Of course, I've never been any good at predicting, and not being much of an optimist, that's probably a good thing. Well...I suppose you could call me a glass-half-empty kind of optimist. Yeah. Most afternoons on my drive home from the office, I listen to Allan Handelman on the local talk radio station (WZTK, 101.1 FM), whose show covers a wide spectrum of subject matter, from politics to rock-n-roll, mainly because it's a little more thoughtful than the shallow, earache-inducing noise of brainless bozos like Michael Savage and Neil Boortz on the same station. This afternoon, Allan's guest was Chris Alexander, the current editor of Fangoria magazine, which was an old favorite of mine back in the 80s. Callers were encouraged to challenge Chris to identify old horror movies they might half-recall from days gone by...and if they were lucky, maybe even stump him. I was enjoying listening to the many descriptions of familiar old movies and Chris promptly identifying them, so I figured, well, if I could get through, just maybe I could stump him. Surprisingly, I got on the show with little trouble, summarized one of my least-favorite old Japanese horror movies—about the survivors of a plane crash being terrorized by a parasitic blob from outer space that takes over its host by splitting his skull and oozing into his brain—and by gummy, managed to stump ye editor right good and proper. 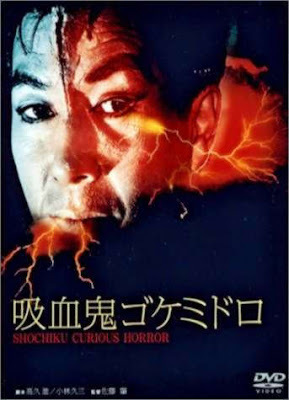 The movie, of course, was the 1968 Shochiku monstrosity, Goke, Body Snatcher From Hell, which I saw on the drive-in circuit sometime in the mid '70s. It's obscure enough, for sure; I don't believe there's an authorized domestic DVD release, though I do have a VHS copy lurking somewhere in the vault. With cheap special effects, lurid cinematography, nihilistic tone, and infuriatingly unlikeable characters, Goke is one of those movies that stands out because of its high annoyance factor; I'd even go so far as to say its glaring flaws are its most endearing feature. Hopefully, it'll get a respectable DVD release one of these days, and I can review it on my Daikaiju site. Alas, no prize for stumping Mr. Alexander, but I did get a whole heaping helping of pleasure getting into some horror on the radio. Thanks, Allan. 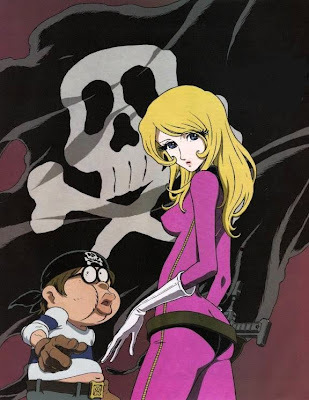 Back in the days of yore (1979–1980-something), I was a knocked-out, die-hard fan of Japanese animation, particularly the work of Leiji Matsumoto (Space Cruiser Yamato, Galaxy Express 999, Queen Millennium, and—above all else—Space Pirate Captain Harlock). I still enjoy the stuff, though I really haven't been much into anime over the last couple of decades. Still, figuring I could put a free trial membership to Netflix to good use, I checked out part 1 of Matsumoto's 2002 series, Space Pirate Captain Harlock: Endless Odyssey, and dang if it wasn't a good bit of fun. 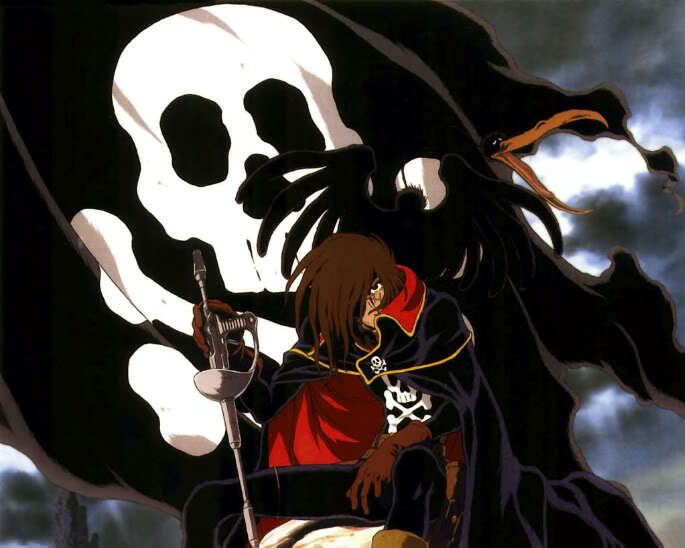 The Harlock series has always been among the grimmest of Matumoto's stories, and this one is no exception. It features a rather Lovecraftian slant, which I must say I appreciate, and the visuals are, as always for a Matsumoto production, quite striking. By all appearances, by the end of episode 3, the earth itself has bought the big one, which even the Great Ugly Azathoth hasn't yet succeeded in doing. During my college days in the late 70s, it was actually the musical score for Space Cruiser Yamato by Hiroshi Miyagawa that drew me to giving the series a try, and after all these years, I still love those Yamato scores and the original Space Pirate Captain Harlock score by Seiji Yokoyama. The soundtrack music for Endless Odyssey is by Takayuki Hattori (Godzilla vs. Space Godzilla, Godzilla 2000), and it's very different from both earlier Matsumoto anime scores and anything else I've ever heard by the composer. Much of it is rather bluesy, quite a departure from the grand, orchestral scores of the original series and the Harlock film, My Youth in Arcadia (as well as its follow-up TV series, Endless Road SSX). It's not my favorite, by any stretch, but it does complement the action pretty well and is overall rather enjoyable. 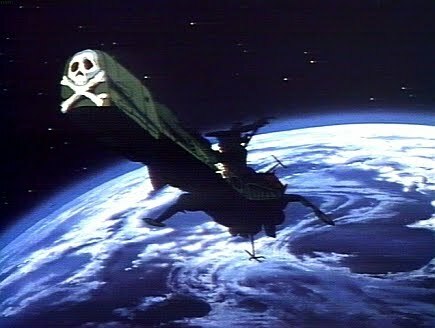 Continuity between the various Captain Harlock series is at best spotty, and at worst nonexistent. Endless Odyssey is ostensibly a sequel to the original 1978 Harlock series (which is essentially a different continuity from My Youth in Arcadia, Endless Road SSX, Galaxy Express, and the others), and for the most part it works in this capacity, although the young protagonist, Tadashi Daiba, is by all indications meant to be the same character (with a few variations in personality) from the original series. Why Matsumoto does this is anyone's guess, but as someone who does enjoy at least some slim binding threads between various related series, I find my teeth gnashing pretty furiously when things don't fit together...really at all. Regardless, I've got a good many more episodes of the show to watch—once they're available—and I've no doubt that the viewing will make for happy times. Yay for me. Show), and Old Man Rodan looking festive. It was a wicked hot, eight-hour trip down to Charlotte from Greensboro yesterday. Yes, I said an eight-hour trip; I was geocaching the whole way. Picked up 39, which I think is a one-day record for me (yes, I realize this is child's play for many of the harder-core). So far at the con, I've been on a few panels, all well-attended (and one a shade beyond lively), sold and signed a few books, and grabbed a few additional caches. At one of the caches yesterday, I came uncomfortably close to getting a face full of bees. I was on the hunt, trudging through some woods, and since I was in fairly rugged terrain—and in a veritable garden of poison ivy—I was watching my step, not so much where I was going. I looked up just in time to find myself three feet from a massive and highly active beehive, with all kinds of honey dripping to the ground. For a second, I prayed mightily that this was not a hive of those legendary killer bees, because I was a fair haul away from my car; fortunately, these little folks paid me no mind and carried on about their business, so I went on and carried out mine. This evening, I headed out to a nearby park, where a half-mile boardwalk takes you out over an expansive marsh. Although there were muggles aplenty gathered at the park itself, I was alone on my hunt for the cache at the boardwalk's end, and I got to see plenty of native wildlife, including numerous frogs, a couple of cute lil beavers munching on some wood, and a very large, exceedingly homely six-legged fiend, the likes of which I've never seen and hope to never see again. Heading home tomorrow. I expect it'll be another eight-hour journey. Lil Godzilla jumps for joy over Blue Devil Island! I would weep if my heart were not so heavy with joy. Check it out here: HorrorWorld Reviews. Scroll just shy of halfway down the page to read the review. 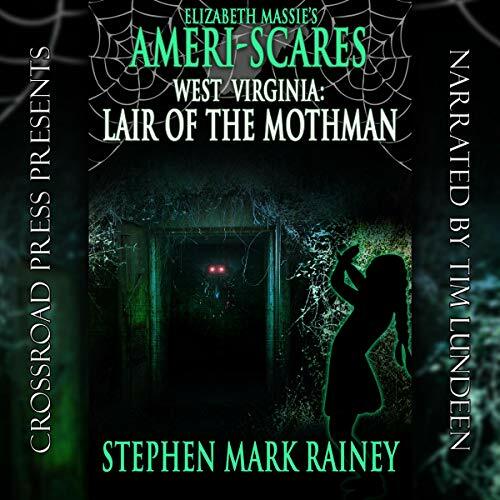 You can also check out the book info at my Web site; click on the cover image for the whole prevue: The Realm of Stephen Mark Rainey. Stay tuned for further news on The Nightmare Frontier, which may yet come out as an audio book from Macabre Ink/Crossroads Press. I like this idea, as I more and more hear things like, "Well, I'd 'read' your book if only it were an audio book!" Axe and ye shall receive, peoples. Making the format ultimately lucrative...that's a whole different animal. And a growing challenge for writers and publishers alike.